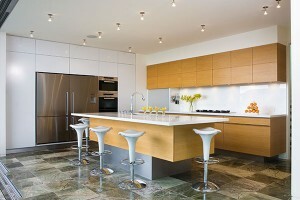 Mastercraft are multi award winners of the NKBA (National Kitchen and Bathroom Association) awards. We have an extensive network of over 30 locations across New Zealand — all with design, manufacture, and installation capabilities. So no matter where you reside or where your kitchen project is located, we have a Mastercraft location in your area. One benefit of having your kitchen produced locally – aside from supporting your local community – is that any alterations requiring factory work can often be completed in the same day. Many of our competitors source their kitchens from Asia which can result in significant delays to remedial work. Another key benefit is that most Mastercraft locations will be happy to give you a tour of the factory while your kitchen is being made. This allows you to inspect the kitchen components prior to installation if you wish. We are so confident in our workmanship, we guarantee that our products, manufactured in-house, will be free from defects arising from faulty workmanship (for each and every owner of the property) for ten years from the date of installation.